Compact water or glycol coolers units with integrated condenser for cooling of tanks. The CLC-1P1200 GreenLine V is the compact water or glycol cooler with integrated condenser. This cooling unit is designed to cool, with the accumulation of ice or water heating. It can be used for cooling beer, ciders, freeze-drying wines or heating mash. Cooling power is 1200 W (5/8 HP). The CLC-4P2300 GreenLine is the compact water or glycol cooler with integrated condenser. This cooling unit is designed to independent cooling up to four beverage tanks. It can be used for cooling beer, ciders, freeze-drying wines or heating mash. 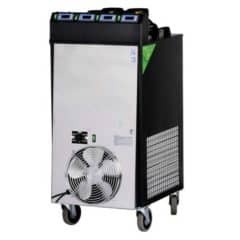 Cooling power is 2300 W.
The CWC-C25 is the compact water cooler with integrated condenser and cooling capacity 2.4 kW. The ‘plug-and-play’ unit CWC-C25 has a compact design. It is space-saving and easy to assemble. 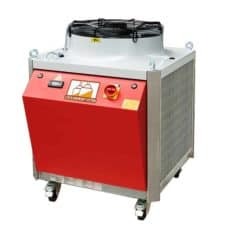 The cooler is equipped with a hermetic motor compressor and a cooling water circuit containing water tank and centrifugal pump. Suitable for cooling tanks with output / input cooling media fittings 2x ½” AG (male) . Designed in Germany. The CWC-C35 is the compact water cooler with integrated condenser and cooling capacity 3.5 kW. The ‘plug-and-play’ unit CWC-C35 has a compact design. It is space-saving and easy to assemble. 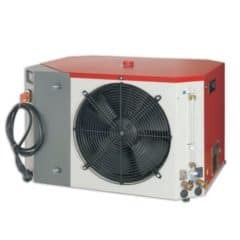 The cooler is equipped with a hermetic motor compressor and a cooling water circuit containing water tank and centrifugal pump. Suitable for cooling tanks with output / input cooling media fittings 2x ½” AG (male) . Designed in Germany. The CWC-C45 is the compact water cooler with integrated condenser and cooling capacity 4.5 kW. The ‘plug-and-play’ unit CWC-C45 has a compact design. It is space-saving and easy to assemble. The cooler is equipped with a hermetic motor compressor and a cooling water circuit containing water tank and centrifugal pump. Suitable for cooling tanks with output / input cooling media fittings 2x ½” AG (male) . Designed in Germany. The CWC-C25MLT is the compact water cooler with integrated condenser and cooling capacity from 0.8 kW (-10°C) to 2.2 kW (+15°C) with Micro-Channel technology. The micro-channel condenser allows the unit to operation on about 30% less cooling gas, it is more silent and even consumes less energy. The ‘plug-and-start’ unit CWC-C25MLT has a compact design. It is space-saving and easy to assemble. The cooler is equipped with a hermetic motor compressor and a cooling water circuit containing water tank and centrifugal pump. Suitable for cooling tanks with output / input cooling media fittings 2x ½” AG (male). Designed in Germany. The CWC-C350 is the compact water cooler with integrated condenser and cooling capacity 3.5 kW. The ‘plug-and-play’ unit CWC-C350 has a compact design. It is space-saving and easy to assemble. The cooler is equipped with a hermetic motor compressor and a cooling water circuit containing water tank and centrifugal pump. Suitable for cooling tanks with output / input cooling media fittings 2x ½” AG (male) . Designed in Germany. The CWC-C35MLT is the compact water cooler with integrated condenser and cooling capacity from 1.1 kW (-10°C) to 3.1 kW (+15°C) with Micro-Channel technology. The micro-channel condenser allows the unit to operation on about 30% less cooling gas, it is more silent and even consumes less energy. The ‘plug-and-start’ unit CWC-C35MLT has a compact design. It is space-saving and easy to assemble. The cooler is equipped with a hermetic motor compressor and a cooling water circuit containing water tank and centrifugal pump. Suitable for cooling tanks with output / input cooling media fittings 2x ½” AG (male). Designed in Germany. The CWC-C450 is the compact water cooler with integrated condenser and cooling capacity 4.5 kW. The ‘plug-and-play’ unit CWC-C450 has a compact design. It is space-saving and easy to assemble. The cooler is equipped with a hermetic motor compressor and a cooling water circuit containing water tank and centrifugal pump. Suitable for cooling tanks with output / input cooling media fittings 2x ½” AG (male) . Designed in Germany. The CWC-C45MLT is the compact water cooler with integrated condenser and cooling capacity from 1.6 kW (-10°C) to 4.2 kW (+15°C) with Micro-Channel technology. The micro-channel condenser allows the unit to operation on about 30% less cooling gas, it is more silent and even consumes less energy. The ‘plug-and-start’ unit CWC-C45MLT has a compact design. It is space-saving and easy to assemble. 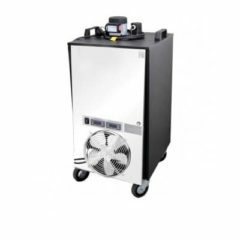 The cooler is equipped with a hermetic motor compressor and a cooling water circuit containing water tank and centrifugal pump. Suitable for cooling tanks with output / input cooling media fittings 2x ½” AG (male). Designed in Germany. The CWC-C350MLT is the compact water cooler with integrated condenser and cooling capacity 3.1 kW. The ‘plug-and-play’ unit CWC-C350MLT has a compact design. It is space-saving and easy to assemble. The cooler is equipped with a hermetic motor compressor and a cooling water circuit containing water tank and centrifugal pump. Suitable for cooling tanks with output / input cooling media fittings 2x ½” AG (male) . Designed in Germany. The CWC-C450MLT is the compact water cooler with integrated condenser and cooling capacity 4.2 kW. The ‘plug-and-play’ unit CWC-C450MLT has a compact design. It is space-saving and easy to assemble. The cooler is equipped with a hermetic motor compressor and a cooling water circuit containing water tank and centrifugal pump. Suitable for cooling tanks with output / input cooling media fittings 2x ½” AG (male) . Designed in Germany. Low temperature version (with Low Temperature Option): cooling medium temperature from -10 °C to + 15°C. 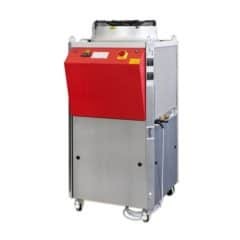 The MLT-models are equipped with an additional plate heat-exchanger that ensures optimal heat-transfer. It is required to add Glycol to the cooling water by outlet temperatures below +8°C. The CWCH-M50 is the compact water or glycol cooler with integrated condenser. 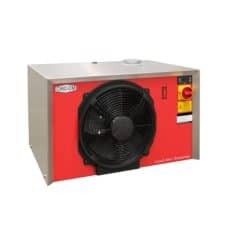 This cooling unit is designed to cool, with the accumulation of ice or water heating. It can be used for cooling (or heating) of beer, cider, freeze-drying wines or heating mash. Cooling power is 6400 W (8.58 HP). This cooling-heating unit is designed for indoor or covered outdoor use. The main advantages are very easy instalation without team of cooling specialists. It is produced with 3-phase or 1-phase electrical standard (EU/USA). Suitable for cooling tanks with volume up to 20,000lt each – output / input cooling media fittings 2x 3/4” AG (male) . Designed in Germany. The CWCH-M90 is the compact water or glycol cooler with integrated condenser. 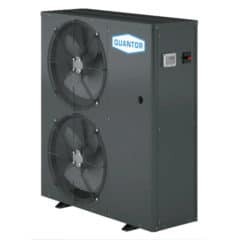 This cooling unit is designed to cool, with the accumulation of ice or water heating. It can be used for cooling (or heating) of beer, cider, freeze-drying wines or heating mash. Cooling power is 10700 W (14.35 HP). This cooling-heating unit is designed for indoor or covered outdoor use. The main advantages are very easy instalation without team of cooling specialists. It is produced with 3-phase or 1-phase electrical standard (EU/USA). Suitable for cooling tanks with volume up to 20,000lt each – output / input cooling media fittings 2x 3/4” AG (male) . Designed in Germany. The CWCH-MCK50 is the compact water or glycol cooler with integrated heat exchanger, pump and water tank. This cooling unit is designed for cooling or heating external media, with the accumulation of ice (or hot) water or glycol. It can be used for cooling (or heating) of beer, cider, freeze-drying wines or heating mash. Cooling power is 6200 W (8.4 HP). This cooling-heating unit is designed for indoor or covered outdoor use. The main advantages are very easy instalation without team of cooling specialists. It is produced with 3-phase (EU/USA). Designed in Germany. The CWCH-M110 is the compact water or glycol cooler with integrated condenser. This cooling unit is designed to cool, with the accumulation of ice or water heating. It can be used for cooling (or heating) of beer, cider, freeze-drying wines or heating mash. Cooling power is 12700 W (17.03 HP). This cooling-heating unit is designed for indoor or covered outdoor use. The main advantages are very easy instalation without team of cooling specialists. It is produced with 3-phase or 1-phase electrical standard (EU/USA). Suitable for cooling tanks with volume up to 20,000lt each – output / input cooling media fittings 2x 3/4” AG (male) . Designed in Germany. The CWCH-MCK90 is the compact water or glycol cooler with integrated heat exchanger, pump and water tank. This cooling unit is designed for cooling or heating external media, with the accumulation of ice (or hot) water or glycol. It can be used for cooling (or heating) of beer, cider, freeze-drying wines or heating mash. Cooling power is 11500 W (15.6 HP). This cooling-heating unit is designed for indoor or covered outdoor use. The main advantages are very easy instalation without team of cooling specialists. It is produced with 3-phase (EU/USA). Designed in Germany. The CWCH-Q181R is the compact water or glycol cooler with integrated heat exchanger, pump and water tank. This cooling unit is designed for cooling or heating external media, with the accumulation of ice (or hot) water or glycol. It can be used for cooling (or heating) of beer, cider, freeze-drying wines or heating mash. Cooling power is 18000 W (24.1 HP). This cooling-heating unit is designed for indoor or covered outdoor use. The main advantages are very easy instalation without team of cooling specialists. It is produced with 3-phase (EU/USA). Designed in Germany.